Yes, the sweet potatoes were sold by weight. I couldn’t remember how much per gram, but one regular-sized (length less than 5” while diameter less than 2”) sweet potato cost me $3.20. I bought one piece each of the yellow and purple fleshes. It tasted so good while eating it hot, but not so when it was cooled. I found the texture too-soft which became a little paste-like consistency in the palate when cooled. Eating sweet potato regularly is good for the health. Sweet potato, especially orange flesh type, is high in Beta Carotene (equivalent to nutrient of Vitamin A), and Vitamin C. Both Vitamins, especially C, are rich in antioxidant properties to reduce free radicals, and hence, it reduces the risk of getting cancer diseases. 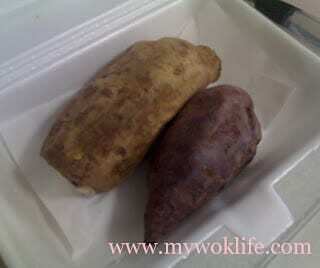 Sweet potato is also high in dietary fiber which helps to smooth your bowel movement. Hence, it reduces hemorrhoid and colon issues. This starchy food is also able to regulate body blood sugar as it has complex carbohydrate which slow down the absorption of sugars to our body, and hence provides us with a steady supply of energy and limits the amount of sugar converted into fat and stored. Sweet Potato contains other minerals such as iron and calcium. Sweet potato counts 123kcal per regular piece. Well, if you preferred to get readily type, try this stall. Otherwise, steam or boil your own sweet potato at home (I had soupy ones with ginger and pandan leaves flavours)! Anyway, I still buy from this stall [Post Note: Store closed down] as I love sweet potatoes, but most of the time, it’s the fried sweet potato ball that I favoured alot! wow that cost a lot for sweet potato hor… i like the orangey red one. cook in lots of ginger soup..hmm feel like having a bowl now.. I like the sweet potatoes sweet soup, too! I tried with the purple and yellow ones.